After a few years of driving a Mini powered by a tuned 998cc engine, Brian felt it was time for a change, and followed the well trodden route of installing a 1275cc engine in his Mini. Or did heá? Exactly how I came to the conclusion that I needed to install the most complicated version of my desired engine into the Mini has since been lost in the mists of time, but it certainly seemed like a fun challenge, as well as creating a car that was somewhat unique. The situation was helped by the fact a friend of mine was rebuilding his own Mini, and wanted an engine with more performance than standard, and so we agreed a deal; he would buy my 998, and I could then buy an MPi engine and ancillaries from a crash damaged car. It wasn’t until I had collected the engine and a big box of other parts that I’d realised what a job I’d taken on. Everything was different, granted the engine would fit in the same hole as before, but just about every device connected to it differed from the car’s original spec, so it was daunting to think I’d have to fit everything and get the car going. What’s more, the MPi Mini was what most people consider a ‘new’ car at that time, so gleaning any information about how things work was always going to be a difficult task; I was limited to strictly one source of information – Rover. A quick day’s work saw the 998 engine and ancillaries removed, and then the real work could begin. Firstly, I welded a plate over the ventilation slots for the side mounted radiator as they were no longer required, providing a strong area to mount the coolant expansion tank to. In the pursuit of extra refinement, I also welded a plate over the unused speedometer hole in the bulkhead, so I could just drill holes where necessary for cables etc. A couple of hours saw the new engine dropped into place, the engine mountings bolted up, as well as the gearchange linkage and driveshafts. After freeing off the rear brakes (the car had been standing for a few months), I could then turn the car around on the drive, and begin one of the jobs I had been dreading since taking on the project: fitting the fuel lines. Anyone that knows Minis will know that the fuel piping curls up behind the rear subframe, trapped by the front beam of it. This meant I had to drop the rear subframe down by several inches, to allow the fuel feed and return pipes to be fitted. Of course, in the years since my Mini was made, and injected ones came along, a whole host of floorpan changes were made to accommodate the additional piping. A little bit of ingenuity provided the solution; making use of the later spec mounting brackets, replicating the studs they are screwed to on late shells with self tapping screws screwed through the floor. Manhandling three lengths of pipe that were over 2 Metres long underneath a car with subframes fitted wasn’t the easiest task – after all, when a car is built, the pipes go on before any of the running gear. Once the fuel pipes were on the car, I fitted the fuel tank. Being as the engine was fuel injected, the tank needed to be exchanged with one that contains a high pressure fuel pump, as well as a fuel return line. 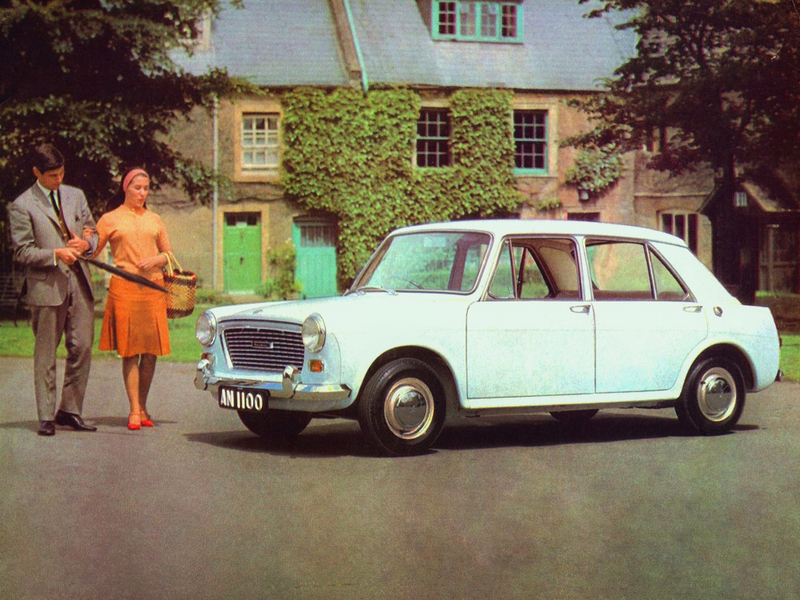 To further confuse matters, late Mini’s also have extra emissions reducing kit, namely a sealed fuel tank and a charcoal canister mounted in the engine bay – to collect any fuel vapours that gather in the tank – hence three fuel lines under the car. Once the tank was securely strapped into position and the pipes connected, I could turn my attention to the engine bay again. Rummaging through my box of parts led me to find the first few parts that needed to be test fitted, these being cooling system components like the radiator and coolant expansion tank. Using pictures of MPi Mini engine bays from magazines, I found the approximate position of the expansion tank, and fabricated brackets to support it. The same was done for the radiator; I quickly discovered that the lower mountings rested on the front subframe in little mounting cups, and the top was held onto the bonnet slam panel. What I didn’t expect was that the front panel needed to be ‘adjusted’ – a half moon cutout was needed to accomodate the electric cooling fan, and the support rail needed moving across also. Once this was done, the coolant pipes could be test fitted. Turning my attention to the wiring, it was clear I needed to remove the last vestages of any original wiring that remained in the car. Oh, of course if this was a normal Mini, things would be simple now wouldn’t they? See, I forgot to mention that bit: that prior to this, I had fitted a Metro wiring loom to the car, with a ton of modifications to go with it. So obviously, these had to be undone. Once I had taken the car back to basics inside, and in the engine bay, I could locate where the new wiring loom had to go, mainly by using educated guesses. After all, the car, despite being 14 years older than the earliest MPi still had the same design, so there wasn’t that far I could go! By placing the wiring through the car, using known fixing points (bulkhead etc), I could then work out the routing, as the position of grommets was fixed on the loom. Again, magazine articles helped, with photos that allowed me to pinpoint where things were sited – such as the fusebox which is mounted below the dash rail by the A post. Numerous detail differences meant that I had to fabricate brackets to support the loom throughout, or drill new holes where necessary. Once I had the car wired up, I could start connecting ancillaries in the engine bay. The position of wiring allowed me to determine the routing of pipes and hoses, which then in-turn allowed more parts to be fitted. At this point, I was happy – things were going very easily, everything fitted nicely, and it all looked as though I’d have the car running within a week or two. Trial fitting of the front mounted radiator. Brackets for the coolant expansion tank welded into position, and alternator fitted. Now I had some initial wiring, I could start to connect the battery and test each of the electrical systems. All of the simple ones, lights, heater etc worked fine – but I approached the engine management with a sense of trepidation, knowing that compared to any normal Mini, the system was highly complex. Everyone I’d talked to, suggesting I was taking on such a job told me I was mad. Why would you want to fit all of that to a Mini, when most people take it all off, they said. Bulkhead soundproofing fitted, all metalwork primed and painted. Close-up of inlet manifold, throttle body and fuel rail. All engine bay work complete..
Dashboard fully installed, MPi instrument pack on show. A saggy tent! New headlining before tensioning. The finished product, with obligatory MG Metro seats and Mayfair velour interior..